Lately, many people have reported facing the error message ‘We couldn’t connect to the update service’ on Windows 10. This issue is known to occur when you try to update the Windows 10 operating system on your system. The issue can be caused by several reasons as you are not able to connect to the update service, just like mentioned in the error message. A few of these factors could be your internet connection, Windows update components etc. The issue has to be resolved quickly as it stops you from receiving the latest updates pushed by Microsoft. Updates are necessary for your system as they usually contain bug fixes, new features, and tweaks along with more stability. The issue doesn’t have an official workaround as of now since one of the engineers at Microsoft stated that a team is looking into the matter and should be resolved quickly. However, there are a few resolutions provided by the community that has proven effective for many users, thus, they are worth a try. What causes the ‘We Couldn’t Connect to the Update Service’ Error on Windows 10? Third-party antivirus: Your third-party antivirus can occasionally cause the error message to appear. The error message can be due to the restrictions put forth by your antivirus. Your internet connection: In some cases, Microsoft isn’t to blame as the cause of the issue is your internet connection. You can eliminate such a possibility by switching to an alternate network. 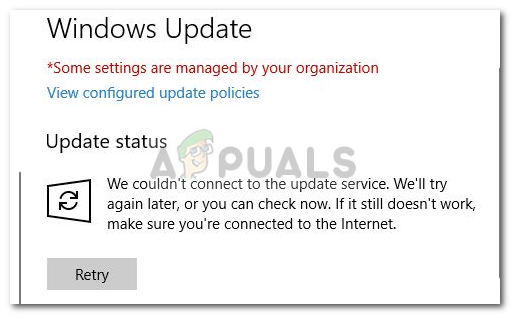 Windows update components: The Windows update components on your system are responsible for successfully downloading the update and then installing it on your system. However, in some cases, you are not able to get the update because one of these components is malfunctioning. That sums up the possible causes of the issue. Now, to fix your issue, you can implement the following solutions. The list below contains ‘possible’ solutions as the issue is still being addressed. These solutions have worked for other users and who knows, it might just work out for you too. The first step that you need to take in order to resolve the issue would be to disable your third-party antivirus. 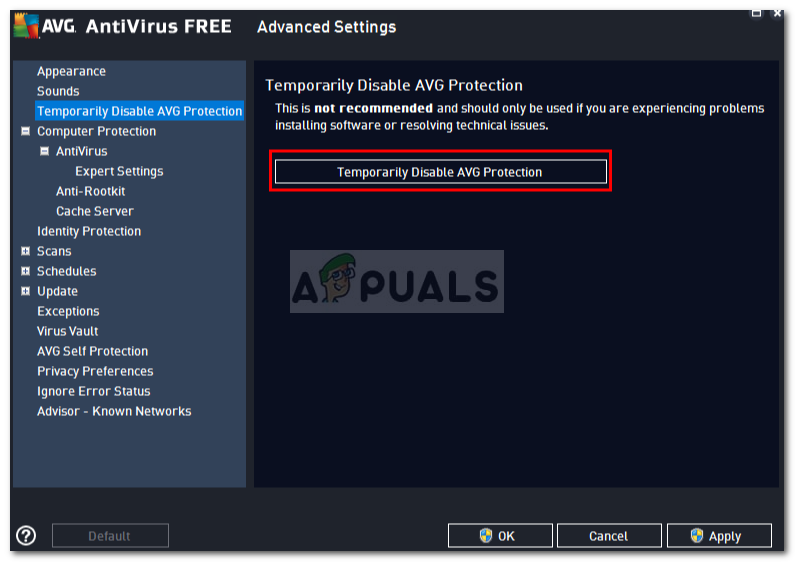 Disabling your antivirus will restore your system’s functionality to the normal state and it will remove all the restrictions imposed by your antivirus. Thus, make sure your antivirus is disabled and then try to check for updates again. For some users, the error happened to be caused by their internet connection. For some odd reason, they were not able to download or look for updates using their network connection. This can be, in some cases, caused by your DNS configuration. If this case is applicable to you, then you should try to use an alternate network. An example would be to use your smartphone’s hotspot and see if you can check for updates using that. In case you are able to do so, you can disconnect that and enable your internet connection again. That should fix the issue. On the right-hand side of the taskbar, right-click the Network icon and select ‘Open Network & Internet Settings’. There, click on ‘Change adapter options’. Right-click on your network connection and then select Properties. Locate IPv4 in the list, highlight it and then hit Properties. Make sure the ‘Use the following DNS server addresses’ option is selected. Enter 8.8.8.8 in the first box and then type 8.8.4.4 in the second box. See if it isolates the issue. Finally, since Windows has its own components that are responsible for downloading the updates and installing them on your system, the issue can be resolved by resetting them. In some cases, they are not operating properly which is causing the issue. In order to reset Windows update components, download this .zip from here and then extract it anywhere you like. Go to the directory where you extracted the .zip file and run the ResetWUEng.cmd file as an administrator. That will reset your update components. See if it fixes the issue.